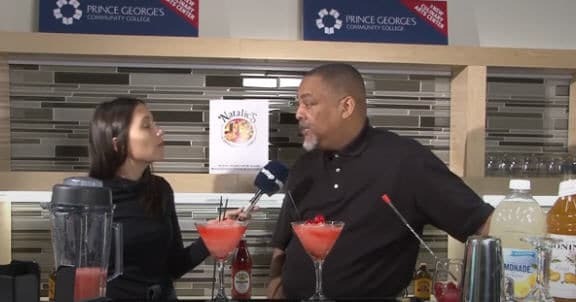 With the holiday season in full swing, Prince George’s Community College Adjunct Professor, Frederick Johnson says it’s time to think outside the box and bring some frozen flair to the mocktail or cocktail menu at your next gathering. The most wonderful time of the year brings with it ancient traditions, past memories and lots of festivities. Whether it’s a cozy night in by the fire, festive cocktail party or celebration with friends, when you think of classic beverage flavors made popular during the chillier winter months, a few flavors come to mind i.e. peppermint mocha, spiced wassail, eggnog or hot buttered rum. But with the holiday season in full swing, Prince George’s Community College Adjunct Professor, Frederick Johnson says it’s time to think outside the box and bring some frozen flair to the mocktail or cocktail menu at your next gathering. In addition to the ingredients below, feel free to experiment with blending in some fresh fruit for a unique twist. And while you might not typically think of December or January as the best time of year for a cold, frozen drink, Johnson says one of the best things about this recipe is that it can be served as a slushy for kids and later on, once they’re in bed, a cocktail for adults! Break out the blender before the hors d’oeuvres and serve as a family-friendly mocktail. Then add your favorite elixir once everyone’s gone home! Whether you’re planning to host or just attending, this light, sweet beverage can be served frozen or shaken as the perfect complement to everything from shrimp to popcorn! Combine ingredients and shake in a shaker or blend with ice in a blender.